Clever, glib, reverent, blasphemous? This long weekend is the last chance see Heavenly Bodies: Fashion and the Catholic Imagination (until 8 October) at the Metropolitan Museum of Art, and form your own opinion. The blockbuster presents 150 fashion ensembles by 20th and 21st-century designers including Christian Lacroix, Jeanne Lanvin and Karl Lagerfeld, incorporated into the permanent collection displays in the main Fifth Avenue building and the Cloisters further uptown, as well as 40 objects dating from the 18th to early 21st century—15 Popes’ worth—lent by the Vatican, in the Costume Institute’s ground floor galleries. In the Fifth Avenue building, sequined Dolce & Gabbana dresses that use Byzantine icon motifs are perched high up in a line down the Byzantine galleries, leading into a display of dozens of outfits in the medieval hall, including some on mannequins lying down in glass cases (more Snow White than saintly tomb). 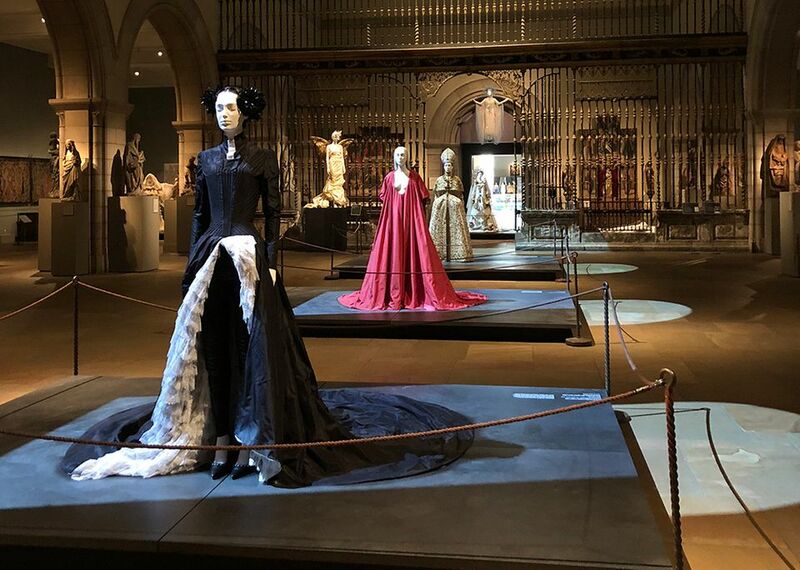 The show really sings in the Cloisters, in displays such as a Balenciaga wedding gown, inspired by a nun’s habit, facing a giant crucifix in a medieval apse. The brilliant interplay of light, texture, material and technology in the work of the Light and Space artist Mary Corse can only be fully appreciated in person. The Whitney Museum of American Art has given the 72-year-old her first solo museum retrospective, Mary Corse: a Survey in Light (until 25 November). It highlights key moments of experimentation across five decades, such as light boxes, which Corse began to make in 1966. Two years later, the artist was able to make these works free and floating, after she took physics classes and developed a technique to power and ionise the argon gas in neon tubes using Tesla coils. In the 1960s, she also began to experiment with utilitarian glass microspheres, more commonly used on roadways, to harness and refract light on the surface of her paintings, which she still uses today, applied over white paint in wide vertical bands. A painting might look perfectly flat and monochrome from one angle, but from another, the microbeads light up in alternating stripes that show the swooping brushstrokes. “I’ve struggled all my life to get maximum meaning in the simplest possible form,” said the late US artist Anne Truitt, whose work has been said anticipated Minimalism. Like Corse’s work, the subtle plays of line and colour in paintings by the artist, better known for her freestanding painted wood totems, can only be perceived by taking them in directly. Find out why at Matthew Marks in the exhibition Anne Truitt Paintings (until 27 October), which has 11 works dating from 1972 to 1994, the biggest show of her paintings since the 1970s. These include large-scale canvases in squares, horizontally oriented rectangles or very tall and narrow strips—8 ft tall, 8.5 inches wide. The colours of Truitt’s nearly monochrome canvases, from brilliant orange to lush green to chocolatey brown, pop in the white-cube space, but also provide an almost orderly moment of calm. Their simplicity can be deceptive: 8 Jan ’72 (1972) for instance, reveals itself to have slightly different shades of green when examined up close. Take time to look at the sides of the unframed works, which are also part of the compositions.